NOTHING LIKE IT ON THE WHOLE GOLD COAST! Our private beach houses are secluded and surrounded by the tropical beauty of South Florida. Our beautiful beach resort offers a laid back atmosphere and plenty of activities and amenities for every member of your family. 300-foot private ocean beach with stair case access to beautiful public beach, heated pool, and private frontage with a dock on the Intracoastal waterway. Individual villas for rent are perfect for any family vacation, or romantic getaway. Royal Flamingo Villas creates a haven of tranquility for couples, families, and retirees. 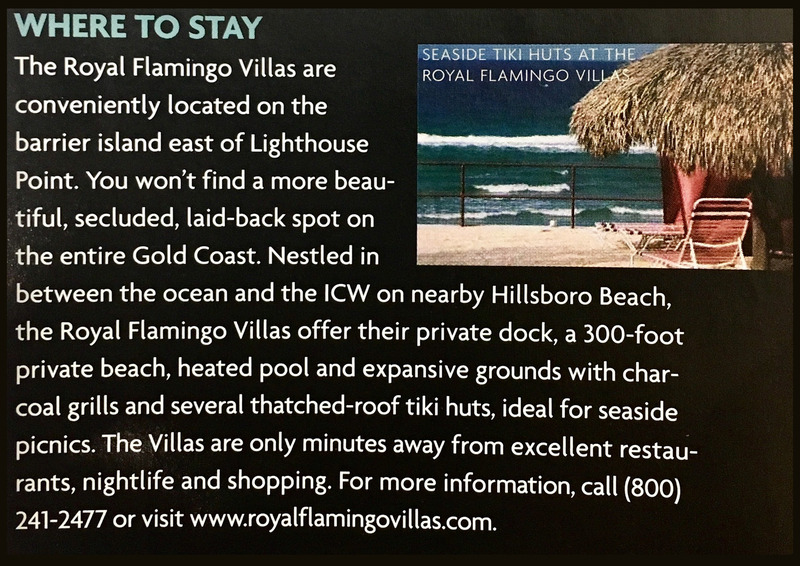 As traveler's favorite beach vacation rental, Royal Flamingo Villas is number one on TripAdvisor, has a Superior Small Lodging recognition, and has been featured in major Florida Magazines. Romantic Floridian hideaway creating the perfect wedding! Picturesque setting, private beach overlooking the ocean.